Blackberry posted a 116 weaning ratio and was a feature at the 2011 SAV Sale. His grandam is the #1 weaning and yearling EPD cow and #3 Milk EPD cow in the SAV herd. 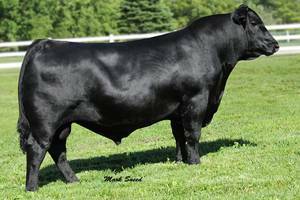 His pathfinder third dam is a maternal sister to stud bulls Density and Providence and the dam of Brave at ABS. Her Right Time dam is the high income producing cow in SAV history. Bleackberry combines tremendous growth and maternal traits!